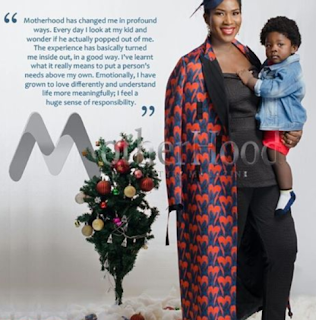 Nollywood actress, Stephanie Linus and her son, Maxwell, grace the cover of the latest edition of Motherhood In-Style magazine, and they look so adorable. 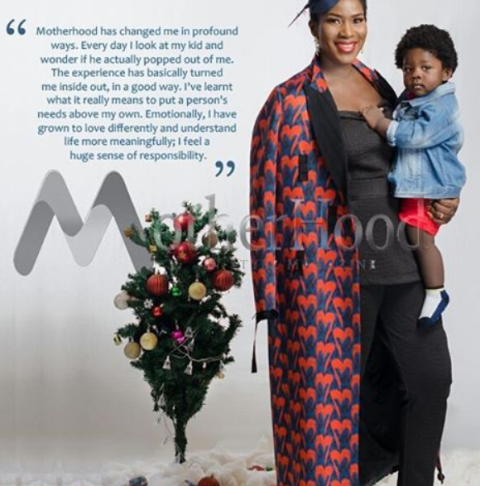 In an exclusive interview with the publication, Stephanie dishes on her childhood, waiting for the right time to become a mother, and what’s next for her career-wise. On pregnancy: My pregnancy was wonderful. The baby didn’t stress me. I had too much energy, maybe that’s why. My energy level was so high. In fact, as some point, I had to tell myself I need to slow down because that was when my film got released, and I did the premieres in Lagos and Abuja. I wished I could do more because I actually felt like I could have done! I’m really grateful to God that apart from the few aches and pains, I felt great most of the time. I loved every kick and even the discomfort of having to carry my big belly around for months. God made everything beautiful in the end. On being ready for a baby: You get married and of course you want to get pregnant, do you understand? You believe God for a child sometimes but you also say, ‘God, I need to be mentally ready to have this baby’, I think I had to be at a point where I was totally ready in my heart, soul and spirit – totally calm to be able to have this baby. I won’t say it’s a choice or something, of course when you get married you’re hoping you’re going to have a child and you’re praying that it happens as quickly as possible. I am just grateful to God that it happened when I was totally ready. On motherhood: Motherhood has changed me in profound ways. Every day I look at my kid and wonder if he actually popped out of me. The experience has basically turned me inside out, in a good way. I’ve learnt what it really means to put a person’s needs above my own. Emotionally, I have grown to love differently and understand life more meaningfully; I feel a huge sense of responsibility. On the body change: I really didn’t stress myself much. I allowed the process to take place while enjoying the changes in my body. I did some workout exercises at some point, but not for long. I wasn’t in a hurry to snap back and didn’t give myself any pressure. I probably ate a lot more during my pregnancy and when my diet was returned to normal, so did my body.